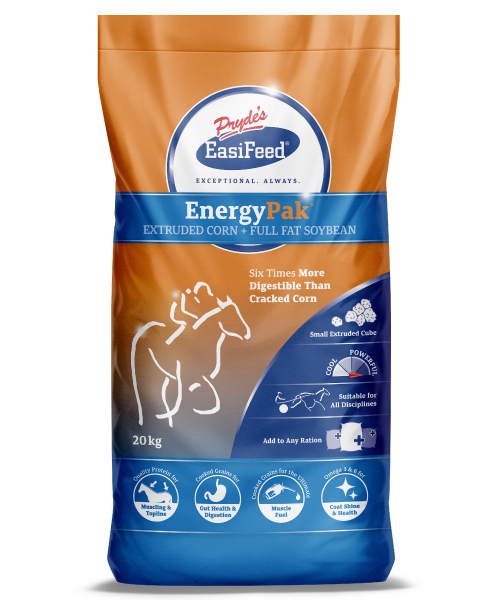 Use PowerPak to replace whole, cracked, boiled or flaked barley or oats or bran/pollard in a horse’s ration. PowerPak keeps starch out of a horse’s hindgut and dramatically reduces the risk of hindgut acidosis; meaning horses will stay calm and healthy. Superior digestibility and maintenance of healthy gut function combine to allow you to feed 25 to 50% less grain for better results in weight gain and condition. Set recipe formulation with premium quality soybean protein used in every batch for incredible muscle building capacity. Omega 3 and 6 fatty acids for brilliant coat shine and skin health. PowerPak® is not a complete feed and must be fed as part of a balanced ration. Introduce into a horse’s ration gradually over 2 weeks. Feed in conjunction with ample forage (pasture, hay and/or chaff). Make clean, fresh water and salt available at all times. Adjust the amount fed so it is appropriate for a horse’s body fatness, stage of training, workload, pregnancy, lactation or development or rate of growth, along with the quality and quantity of forage available. Divide feeds into two or more smaller meals if feeding more than 0.5 kg per 100 kg of bodyweight in ‘hard feed’ per day. PowerPak does not contain added vitamins and minerals so it needs to be fed as part of a balanced diet. To meet vitamin and mineral requirements, you should feed PowerPak together with any of the Cubes, Pellets or Sweetfeeds from the Pryde's EasiFeed range, or use one of the pellets from the Pryde's EasiBalanced range.